1895 was a very important marker for Senglea, at least as far as football was concerned. The records show that at this early date there was already a football team operating in the city. It was on March 30, 1895 that Isola United played against the Union Club, of Cospicua, at St Clements football ground. Isola United lost 2-0 but the occasion marks the birth of the game in the historic old city. This date is not so far away from 1890 when their neighbours St George's were formed. Information from that early period of the Maltese game is scarce. However, we can ascertain that another club, this time bearing the name of Senglea Shamrocks, were formed some time around 1906. Some sources quote November 14, 1906 as the exact date of the formation of the club. They had premises at 215, Strada Due Porte and later on they moved to no. 68 in the same street. The Shamrocks were active between 1906 and the start of the First World War in 1914. At first, they only played friendly matches against service teams but in May 1908 they accepted a challenge from Melita Vittoriosa to play a match for a challenge cup. This game ended in a 1-1 draw but a week later the game was replayed and Melita Vittoriosa won 1-0. The national league was organised for the first time in 1910 but Shamrocks did not take part. The next season, however, they figured in the cup competition organised by the owners of the National Football Ground. In the first round, Shamrocks were awarded a walkover by Melita Vittoriosa. Then, in the next round they were eliminated from the competition by Valletta United 4-0. This was the start of competitive football in Senglea. However, the Shamrocks' life in the league was short and uneventful. Between 1910 and 1913 they took part in the league once and three times in the knock-out competition but they did not record a single victory. Much worse is the fact that in 1913 they were beaten 13-0 by Ħamrun Spartans. In 1913-14, the Shamrocks took part in the league but again they did not set any houses on fire, although this time they managed to win three points from six matches. Then came the war and the team disappeared completely from the football scene. In 1921, came the turn of Senglea United. Their premises were in Triq il-Bastjun where today there is the Primary School. In their first season, Senglea United took part in the Second Division with very little success. By 1923-24, however, the performances of the team had improved considerably and that year they were among the hottest favourites to win promotion. All games were balanced and a keen competition was anticipated, but towards the end of the season trouble broke out in two matches and the progress of the league was completely disrupted. 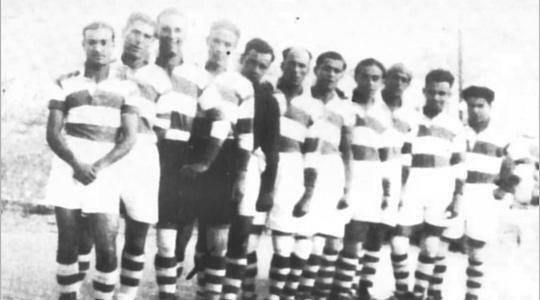 In the match Marsa-Gżira Lions, played on March 10, 1924, fighting broke out between the players when the score was still 0-0 and the game was abandoned. In the investigation that followed, Marsa were found guilty and suspended. A few weeks later, Gżira were again in the limelight. In the match against Senglea United, they were trailing 0-5 when the players were involved in a free-for-all. The match was abandoned and this time both teams were banned from the league. After this incident, Senglea United were disbanded but in 1928 they were reformed. That season they took part in the Amateur League but for some unknown reason midway through the championship they were again disbanded. Four years went by before Senglea United appeared once again in the picture. This time they took part in the Second Division of the MFA League. Between 1932 and 1936 they hovered around the bottom places of the league table until they were relegated to the Third Division in 1936-37. They stayed there up to the start of the Second World War when, as happened to other small clubs in that particular era, they were dissolved. This time they were never reformed, making way for Senglea Athletic which were formed in 1934.